If you’re starting off with an over-sized bag, it’s likely you will try to fill it to capacity – even if you don’t need those two extra pairs of shoes! Make sure to choose the right size bag for your time away from home, that way you will be filling it with exactly what you need and not be left with extra space, and ultimately, a heavier bag than what is needed! This all-time favourite packing technique will save you space and time! Try and roll your clothes into sausage-like shapes or fold them into the smallest size possible, packing items closely together as you go. 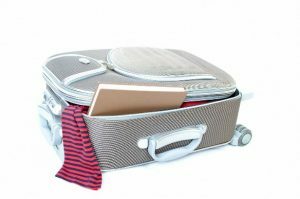 This maximizes space and will also save you time when unpacking or looking for a particular item in your bag. Pro tip: if your clothes take up more than one-third of your bag, you’re packing too much! Choosing the essentials and packing light pays dividends – saving you time and energy! This basic technique is based on: three pairs of socks, three pairs of underwear, three pairs of pants, three shirts. Wear one, wash one, dry one. Try and choose light, flowing, quick-dry materials if you’re holidaying in a warm climate, which handles creasing well! ‘You don’t need that, or that, and not that either’ – a phrase that should be kept in mind when packing light. 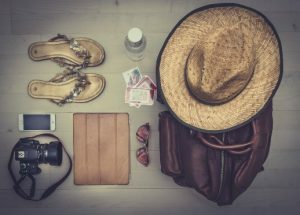 The unknown of travelling may convince you that you need to surround yourself with familiar things, but in reality, you probably don’t need all the extras. In the event that you will, you can always buy it or borrow it! Take the stress out of packing for your road trip on one of our private bus rentals by packing smart! If you’re looking to plan a getaway with friends, family or colleagues, CK Travels offers private bus rental, ideal for groups of 15 all the way up to 70 people. Pack light and enjoy a stress-free getaway with us!